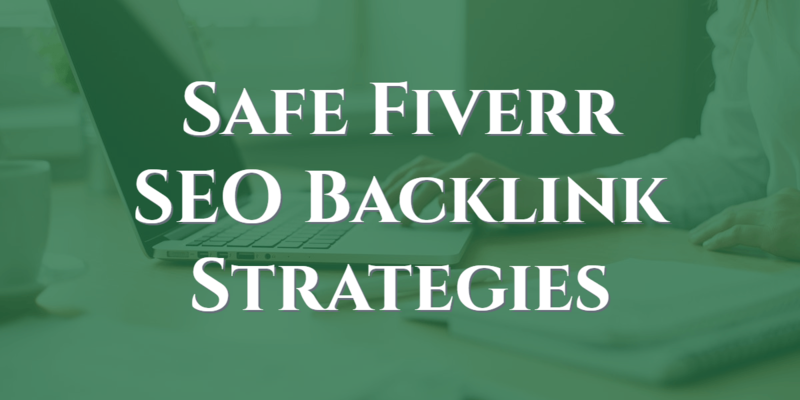 Fiverr has some great services but for many of us we avoid the SEO services due to reviews being given by people who might not really know the damage being done by some of the services on offer. There are some decent SEO gigs there too though and as and when i get time we will use the following strategy to test and watch the results. Make sure you optin to the email list to get notified when i publish the results which should be next week for the first one using some local SEO keywords. The important thing for me is to stick closely to ranking factors that we know about. This strategy is based on the number of referring domains being a major ranking factor and also partly about adding some diversity into the link profile we will build and also its about the added value that we can add with content by repurposing stuff that you have already created. Infographics offer a great opportunity for quick easy backlinks at low cost but there are some ways we can take it further with blogger outreach and get links from relevant sites as well as from infographic submission, image, social and doc sharing sites. The best way to do this is take a blog post with suitable content to make an infographic from that also has a video that you created around the topic of the blog post. 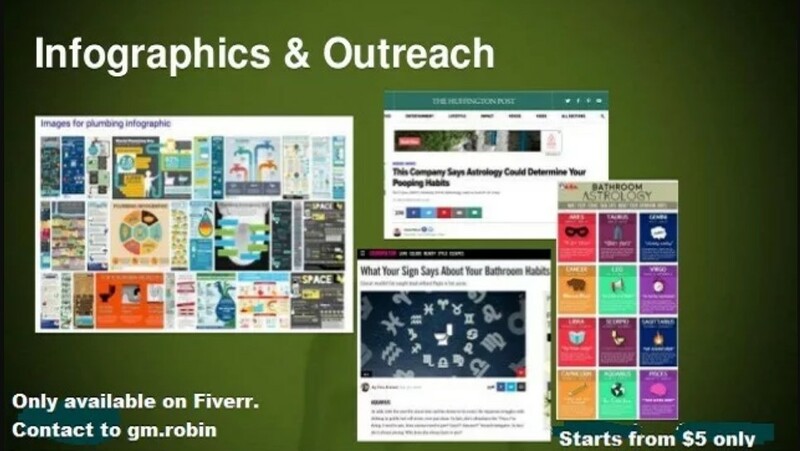 Here is a recommended flow, starting with infographic creation and submission to 40 infographic sites, then use your infographic for the next fiverr gig which will find prospects based on them sharing similar content and also do outreach to them. 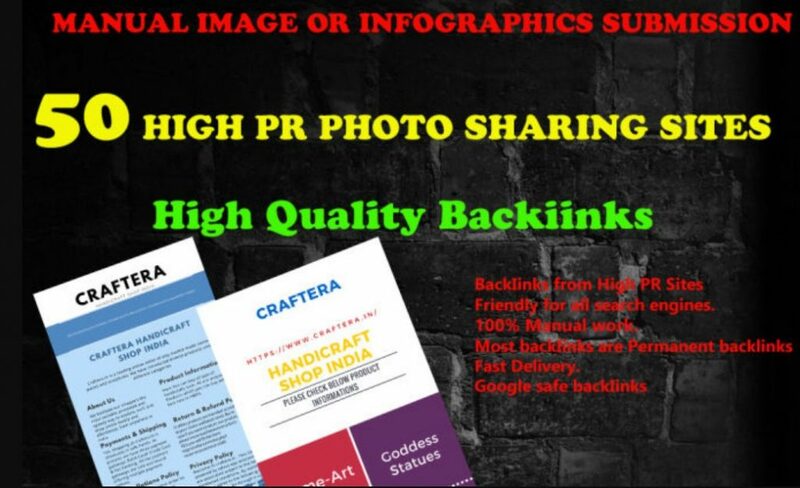 After that we can submit to the top image sites and the turn the infographic into a PDF and submit to Doc sharing sites and well as get some social image sharing links and 2nd tier backlinks to those. What this does is give us a wide range of referring domain types as well as massive increase on referring domain numbers and many with niche relevancy from the outreach gig. 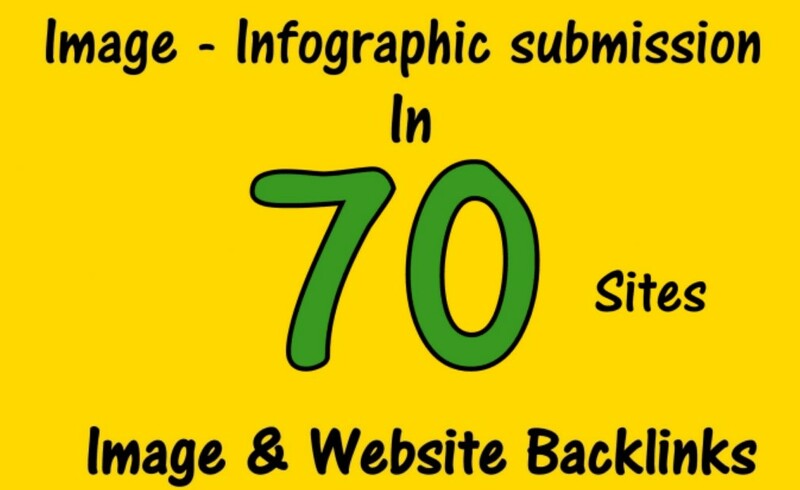 This is an infographics submission service to top 40-80 sites. I will also provide your with proof of submission such as excel spreadsheet with public url. This is a manual submission . Some are auto submit sites and will review by site-admins. Now we can make the infographic or blog post featured image into a Jpeg file and use this gig to get some links from image sites. 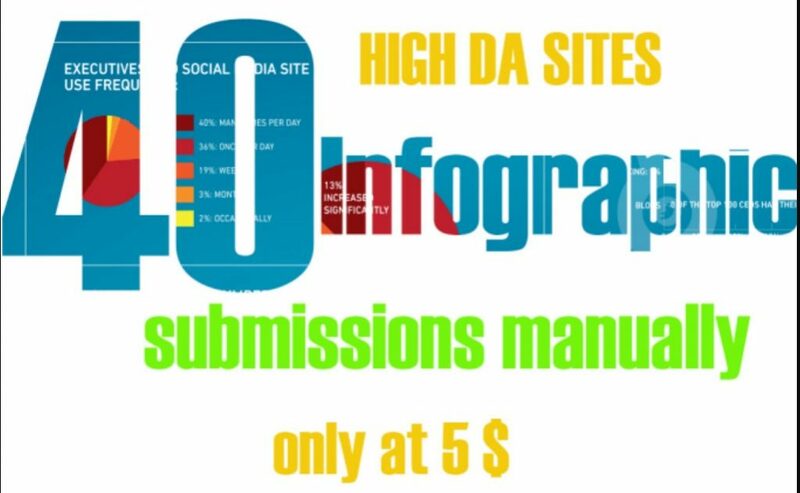 Will submit your image or Infographics 50 image sharing site. Complete Report will be provided in a detailed excel sheet. Google Safe, Improve SERP with Image. For a premium gig, will perform all steps such as outreach and 2 follow up and more within the gig time if needed. For rest of the gig I will be able to do initial outreach only. Note: This is outreach strategy, not guaranteed live link strategy. I can just do my part properly but can't give live link guarantee here. Now we can take the original PDF and have it submitted to some Doc Sharing sites. Without knowing the quality of sites for the gigs that have 50+ submissions we have a couple of options and decisions to make. Get the gig with the highest amount of sites and link to a YouTUbe video with it and see if it increases rankings. Just make sure you have ONE link in the description which links to your blog post. Get one of the 30 sites or less doc sharing submission gigs and link direct to your blog post as we know these will be using the top doc sites like scribd and docstoc etc. 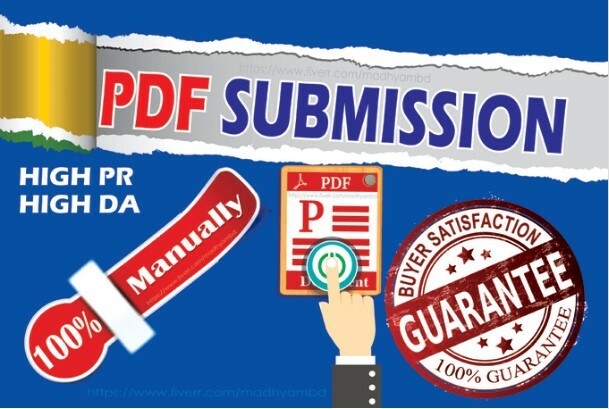 Why PDF submission / Share? PDF submission is one of the best techniques to improve your online presence & increases your vulnerability to be picked up by your potential clients. Document sharing has the important role in SEO if we get the backlink from here it boost rank & placed you in the top 10 results. 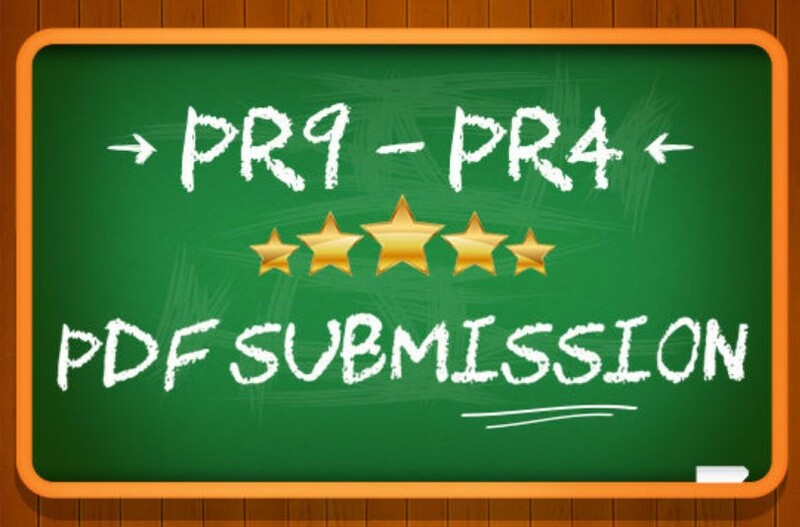 Document submission is now became very popular in the field of online promotion and submission of files in free PDF sharing sites list or high pr document sharing sites list is highly valuable in eyes of search engines because most these kind of websites gives dofollow backlinks free of cost. It is not only limited to getting inbound links only but it is the way to spread your presentations about your products or services through the file sharing using these document share websites. What are the Benefits of PDF Submissions On Doc Sharing Sites? These sites can generate a lot of traffic to your website. The longer the document, the better. This one is listed in fiverr as image sharing sites when in fact it is social links but they do some second tier links to the image links too. It make it an interesting gig so i have included it just for the sale of diversity although i would be more inclined to test this with a YouTube thumbnail used for your image link and linking to your YouTube video that links to your blog post. 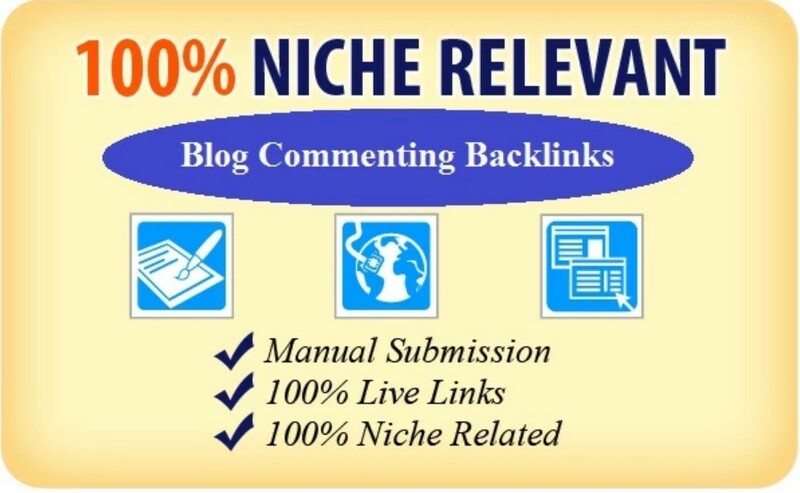 mage submission service has become a powerful and useful SEO tool. I will scrape an image, or you can provide your own image. 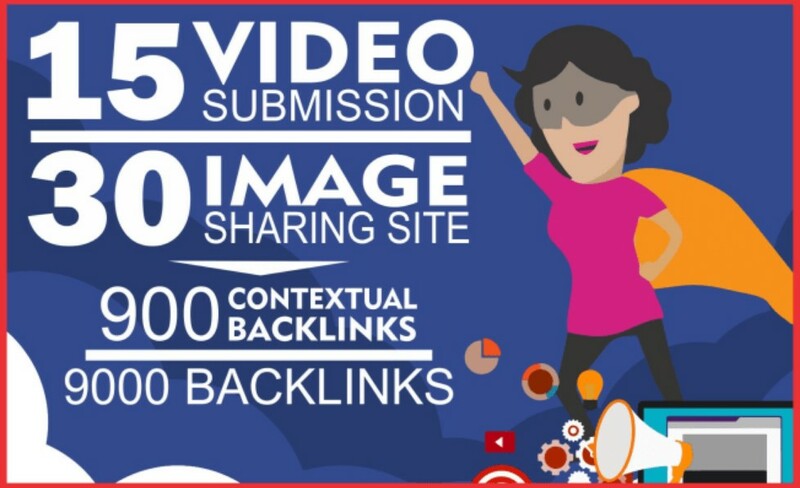 Then, I will send it to the top 10 image sharing sites and than create 200 contextual backlinks and 3000 backlinks to them to maximize the link juice. ***Search Engines Safe! *** Full report! Ideally You Would Use A Tool Like BuzzBundle which can help you find relevant content from multiple sites and blogs and monitor them too. 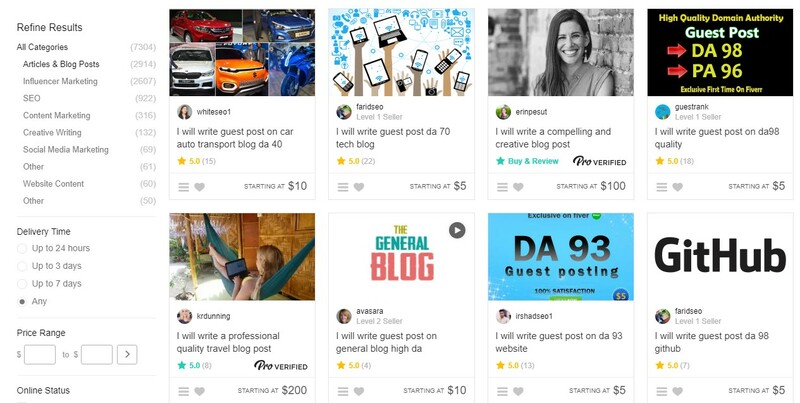 However it can be a bit of a learning curve and if you just want some fast referring links from niche related blogs then there are one or two “decent” gigs on Fiverr we can use. I do 100% manually written posting. I will read each post carefully and comment accordingly, no generic phrases! I’m committed to helping you succeed. This second Gig is does drip feed over 30 days which will keep things looking natural. We will 30 Days Drip Feed Service with High (DA PA TF CF) 100% Safest Domains that will guarantee IMPROVE YOUR GOOGLE RANKINGS! You can buy blog comments from anyone but the major question is, no one is testing their skills and techniques the way SEO Companies do. That's the main point why we are assuring you to buy this service with 100% assured and confident that you are giving this work to the leading SEO company in India. 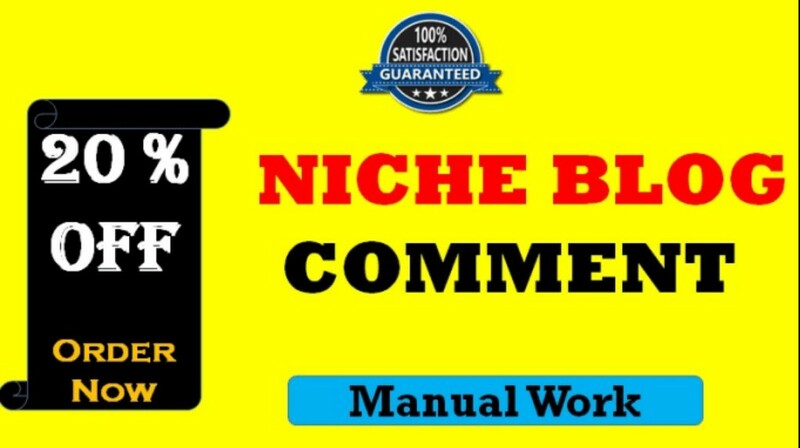 100 Manual Blog Comments Extremely High Metrics & LOW OBL! 30 Days Drip Feed Blog Commenting Service. After these you can find some niche specific guest post opportunities too if you’re willing to spend a bit more per Gig. 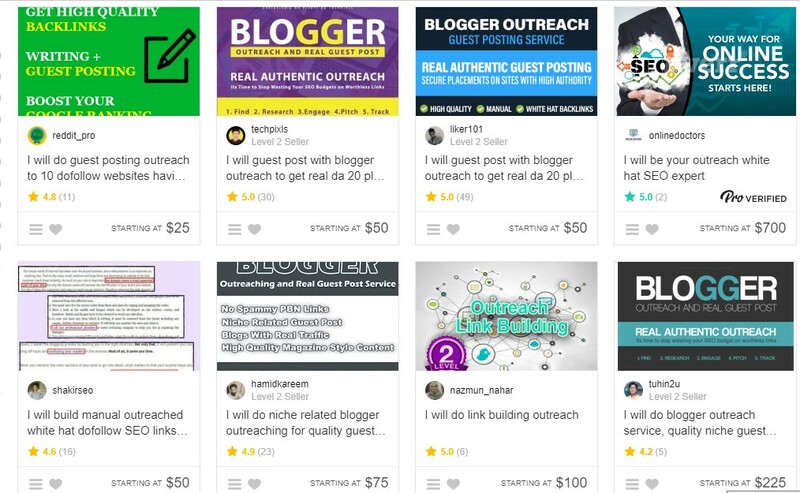 These gigs come in various price ranges and quality so you really need to manually check the sites before ordering as some will be spammy, but there are some decent niche blog options in fiverr too. Obviously i can’t recommend any specifically as i don’t know your niche but there are multiple search variations that you can use. As you can see there is quite a variety of options from high quality writing, blogs through to guest posting on well known sites ranging from 5 bucks up to several hundred. Obviously the higher quality opportunities are going to cost more. 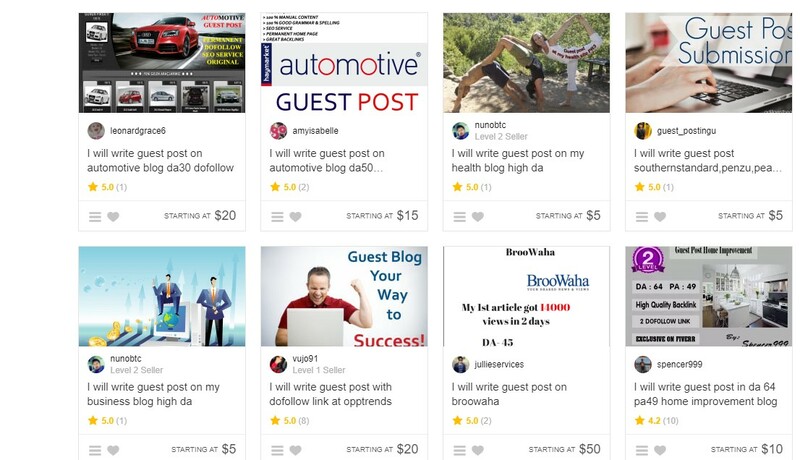 My advice would be to have a splash screen optin on a relevant blog post or content upgrade from your guest post to send any traffic to from any blog that you posted on and for the fiverr gigs i would be looking more at the blogger outreach gigs. Outreach is super powerful and it's what all the white hat SEO’s do and it makes their rankings sticky. To do it properly you will need a high quality blog post which is either time consuming or its going to cost money. However as we seen at the beginning of this post, a simple infographic can cut down the amount of work needed for maximum links with one piece of content. Do You Want To See Some Case Studies Doing This For Affiliate Marketing, Launch Jacking, Local Seo And Video Marketing? Sign up to the email list and i will send them out periodically by email as and when i get time.